Content marketing, of course, starts with having vibrant, interesting content in the first place. With Europa Science’s experience in creating content for science and technology markets, we are the perfect partner for companies wishing to develop a portfolio of content marketing collateral. From white papers to case studies, from CEO interviews to product information, any content you produce has to be created in a professional and consistent manner. Whether it’s writing something from scratch, or rewriting content that already exists, we can help by understanding who you intended audience is, what the appropriate benefits of your product or service are, and then creating tightly-written, interesting and relevant copy that can be placed on multiple platforms (perhaps, even, one of ours!). Using our experienced in-house editorial team, you can be assured that we understand your market, and can advise on how best to get your message across via content. Complement the content on your own site with expert blogs, thought leadership pieces and white papers. These help focus your company as a centre of expertise within your market, rather than just being a provider of products and services. You will already have a wealth of knowledge within your company, and we can help you share that via sharply-written content. Often, it’s not just a case of uploading some words to a website. You might want to create a downloadable PDF for prospects to digest. So, use the talent and resource that we have to ensure your content is showcased in the best possible way – we can source images, create infographics, charts and tables, and develop a design for your marketing collateral that serves your market. ProQuest is a global company providing content, technology and expertise to support scholarly researchers and librarians worldwide. 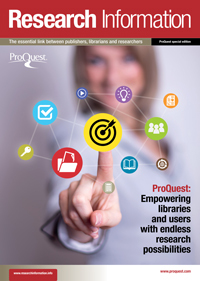 As such, our existing magazine Research Information has provided high-quality, independent coverage of ProQuest’s work in this area over many years. The company wanted to take advantage of Research Information’s position in the market by asking us produce a bespoke edition of the magazine for them. Through its relationship with Scientific Computing World, Samsung engaged Europa Science to create an 8-page promotional magazine showcasing its work in the high-performance computing markets. We helped the client define the content, carried out the interviews for the case studies, and carried the projects through design, layout, approval, printing and delivery. To enquire about our content marketing services, contact Warren Clark on +44 (0)1223 221031.